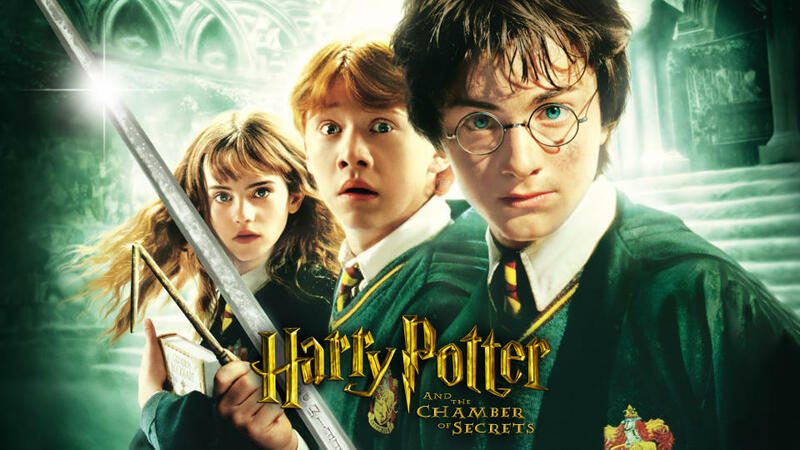 Harry Potter and the Chamber of Secrets (2002) – Movie Review – Another Movie Blog! I don’t like to bring up the books too much when it comes to reviewing adaptations. No culture exists in a vacuum, and knowing elements of a book does help to explain where a movie succeeds or fails, but a movie should always exist on its in terms. But I thought it best to mention that Harry Potter and the Chamber of Secrets, as well as my least favourite Harry Potter film, is also my least favourite of all of Rowling’s novels. The structure between it and the first is too similar, the plot is strung together by coincidence and deus-ex machinas (that car! ), its a mystery novel in which all the clues are handed to the characters without them really finding them, and the red herrings reveal things we pretty much could figure for ourselves, meaning that there is a lot of moving around from set piece to set piece without much sense of momentum. The only big thing it has going for it has going for it are individual ideas and locations, and all the horcrux stuff is only interesting in hindsight. For another Star Wars comparison, when both Rowling and Lucas said they had the series planned out in advance, I think on some level they were lying. Oh, and the fact no-one died in this movie is actually ridiculous. So, as with the last movie, Chris Columbus’ main fault is that he stuck too faithfully to the source material. This is the longest movie of the series, and there is absolutely no reason for it to be. Unlike the last film, the episodic structure does feel languished and boring at points. But to be fair, although I think scenes could have had sped along with more energy – when Hermoine says “just go, you’re wasting time”, I agree – I don’t know what parts he could have cut that wouldn’t have meant changing key story details. Because of that lack of immersion, I think I noticed a lot more patronising exposition dialogue in this movie than the previous. When there’s a rogue bludger, or Fawkes blinds the Basilisk, its not just worth it that we are seeing these things happen, the dialogue has to literally tells us things as they are happening (which is there throughout the series, but here it becomes obnoxious). The final scenes with Lucius are particularly bad in how much it has to spell it out for people (and although I can’t help but be won over by the final Hagrid scene, it is toxic schmaltz). Which is a shame, because in other elements Columbus tries to mature. I think he took the bland direction criticisms to heart, because there’s a lot more going on with the camera in this film. Swooping crane shots, switches in perspective and dutch angles abound, and he really uses the capabilities of the CGI to be a little ambitious. The fact that most people say that the two movies are ultimately similar, though, does suggests that no one has really noticed this, and in fact some of dutch angles are particularly distracting if you are looking for them. I’ll admit, this time around watching Dobby did get on my nerves quite a bit in this film. Oh, Toby Jones does some fantastic, barely recognisable vocal work, like Gollum the CGI impresses today, and the events of this film paid off for me in Deathly Hallows Pt.1. But beyond the crying I was struck this time by just how much he pops up to just be really vague and create trouble just to have action set pieces at the beginning. Oh, and the whole slave subtext with the elves is a bit troubling. In fact, I also realised that every major plot point in this film revolves around prejudice and bullying. The mudblood stuff, the elves as slaves, even Hagrid’s mistreatment. This isn’t a positive or a negative, it was just something I thought was worth pointing out. And with that, I’ll move on to what I do like about this movie, because there is still a lot to like. The sets are still wonderful, and every new addition from the Weasley house, to the forests, to the bathroom to ultimately the Chamber of Secrets all impress. Similarly, the creature here are all great, particularly the two big beasts of the Basilisk and Aragog who provided genuinely tense scene. These elements are all helped by John Williams still incredible score, particularly his theme for the forest and its encroaching and suspenseful strings. The main thing that elevates the movie is the cast, both new and old. Watching the first and second films so immediately after each other you can tell that the main cast has not only matured as people, but grown slightly as performers (particularly Radcliffe and Watson dropping the over pronunciation). Alan Rickman is still great, especially in duel scene and when he chews the boys out for damaging the Whomping Willow (which would have a greater presence in the next movie), and his gravitas compensates for lack of screen time. Robbie Coltrane’s Hagrid is given a lot more to do here and as loveable as ever doing it. The main joys for me revolve around the new additions, all over the top in some manner and all glorious. Shirley Henderson as Moaning Murtle is pretty incredible for an actress who was in her mid thirties, but it helps to bring the slightly uncanny feeling Murtle has on people. Jason Isaac’s as Lucius Malfoy is a malevolent joy, all bleach blonde hair and snarl. My favourite inclusion, though, is Kenneth Branagh as Gilderoy Lockhart. His smarmy, preening charlatan with tons of charisma and over emphasising every emotion really is a role he was born to play, and as he is only in this movie it is almost worth watching the whole movie for him. In fact, Kenneth Branagh is a director; why didn’t we get him to do the movie? He likes dutch angles too! P.S: Did you know this movie has an after credits scene? Because up until this point I didn’t. That was a nice surprise.